Late Quaternary fossil deposits from The Bahamas, Cayman Islands, and Cuba contain fossils of the Cuban crocodile Crocodylus rhombifer. This species survives today only in Cuba and Isla de la Juventud (formerly Isla de Pinos); the populations in The Bahamas and Cayman Islands are locally extinct. Large fossil samples, including skulls, are known from underwater caves (blue holes) on Abaco in the northern Bahamas and organic peat deposits on Grand Cayman. Diagnostic cranial characters shared by the fossil crocodile skulls from Abaco and Grand Cayman and recent skulls of C. rhombifer from Cuba are: short, broad, and deep rostrum; prominent orbit; concave interorbital region and cranial roof; strong ridge on internal margin of the orbit and lateral margin of the cranial table; large, rounded protuberance on the posterolateral corner of the squamosal; premaxillary-maxillary suture on the palate transverse at the level of the first maxillary tooth; and 13 teeth in the maxilla. Using a ratio derived from living crocodylians of head length (premaxilla to parietal) to total length of about 1:7.2, approximate total lengths for fossil specimens of C. rhombifer from Abaco range from 1.3–2.3 m (mean 1.9 m) and Grand Cayman from 1.6–2.0 m (mean 1.7 m). Quaternary crocodylian remains are known from many other islands in The Bahamas, including Acklins, Crooked Island, Eleuthera, Grand Bahama, Mayaguana, New Providence, and San Salvador; however, most of these fossils are not complete enough for a species identification. Shells of an extinct species of the land tortoise Chelonoidis from Abaco and Mayaguana with crocodylian bite marks, jaws and teeth of capromyid rodents from Grand Cayman that appear to have been digested by a crocodylian, and data from carbon (13C/12C) isotopes derived from crocodile bones, as well as the lack of large freshwater vertebrates, suggest that C. rhombifer in The Bahamas and Cayman Island had a diet primarily consisting of terrestrial vertebrates. Evidence from stomach contents and behavioral ecology of extant Cuban crocodiles from Cuba further supports the terrestrial feeding habits of C. rhombifer. Radiocarbon (14C) dates on crocodile postcranial bones from Sawmill Sink and Dan’s Cave on Abaco range from 2,780–3,680 years Before Present (BP). Radiocarbon dates on peat associated with fossils of C. rhombifer from the Crocodile Canal site on Grand Cayman range from 375–860 years BP. These dates confirm that Cuban crocodiles survived into the late Holocene on Abaco and into the historic period on Grand Cayman. Evidence from a variety of sources, including radiocarbon dates, fossil and archaeological sites, and historical records confirms that the local extinction of crocodiles in The Bahamas and Cayman Islands occurred within the past 500 years, probably resulting from overhunting by humans. Fossils of C. rhombifer on Grand Cayman and Abaco, and probably throughout The Bahamas, verify that the Cuban crocodile was considerably more widespread in the West Indies during the Late Quaternary. This specimen was collected from the Sawmill Sink blue hole, Abaco Island, northern Bahamas. It was made available to the University of Texas High-Resolution X-ray CT Facility for scanning by Nancy Albury of the National Museum of the Bahamas and Dr. David Steadman of the Florida Museum of Natural History. Funding for scanning was provided by Dr. Timothy Rowe of the University of Texas at Austin. Funding for image processing was provided by UTCT. This project is a collaboration of UTCT, the National Museum of the Bahamas, and the Florida Museum of Natural History. This specimen was scanned in order to make rapid prototypes, or 3D printouts, for use in education and community outreach programs, travelling exhibits and permanent exhibits for the National Museum of the Bahamas. The 3D models and visualizations provide exciting visual aids that will enhance public education of the natural history of the Bahamas without compromising the integrity of the singularly unique and beautifully preserved fossils. This specimen was scanned by Matthew Colbert on 27 March 2013 along the coronal axis for a total of 711 slices. Each 1024 x 1024 pixel slice is 0.5 mm thick, with an interslice spacing 0.45 mm (for a slice overlap of 0.05 mm) and a field of reconstruction of 179 mm. Morgan, G.S., and N.A. Albury. 2013. 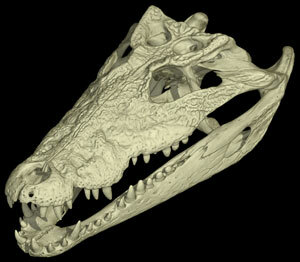 The Cuban crocodile (Crocodylus rhombifer) from late Quaternary fossil deposits in the Bahamas and Cayman Islands. Bulletin of the Florida Museum of Natural History 52:161-236. 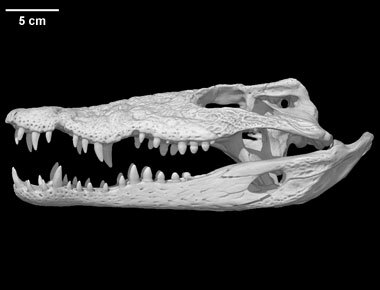 To cite this page: Nancy Albury, Dr. David Steadman, Florida Museum of Natural History, 2015, "Crocodylus rhombifer" (On-line), Digital Morphology. Accessed April 24, 2019 at http://digimorph.org/specimens/Crocodylus_rhombifer/.